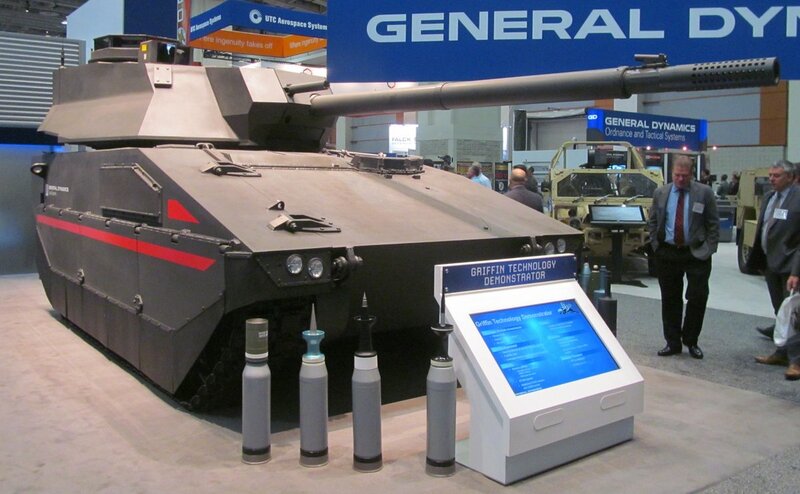 At the Annual Symposium of the US Army (AUSA) 2016, the US company General Dynamics has presented it's new Griffin light tank technology demonstrator. 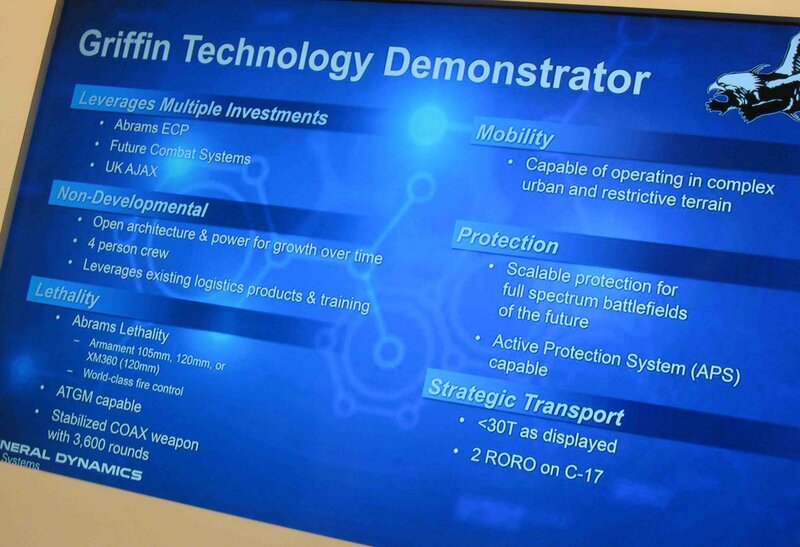 The Griffin is meant to demonstrate the abilities of General Dynamics to create a modern light/medium tank with technologies that could be utilized on upgrades for existing vehicles. It is apparently aimed at the US Army, but also at the British military, which originally planned to buy a direct-fire support version of the Scout-SV (ASCOD 2). The Griffin is based on combined technology from the development of the Ajax version of the ASCOD 2, the Engineering Change Proposal (ECP) upgrade suggestion for the M1 Abrams tank and leftover technology from the Future Combat Systems (FCS) program. It is designed to fit two Griffins into a single C-17; the weight of a single vehicle is less than 30 metric tons. The Griffin uses a tracked chassis, which seems to be based on a composite fibre construction, a technology already tested during the 1980s and 1990s. It has been utilized in certain places on a few combat vehicles such as the K21 infantry fighting vehicle (IFV). The roadwheels and tracks are covered by a rubber flap, which reduces dust creation and can positively affect the thermal signature. The composite construction should reduce the noise generation and provide improved stealth characteristics. Alternatively the Griffin hull might still utilize a steel or aluminium construction and is only covered by some glass-reinforced fibre material for better stealth characteristics. The Griffin's chassis seems to be a modified ASCOD 2 (Ajax) chassis. The Griffin is armed with either a 105 mm or 120 mm gun. It seems that the prototype might be fitted with a version of the XM360 tank gun. A coaxial machine gun is also fitted, based on the available ammunition it should be either a 5.56 or 7.62 mm machine gun. The Griffin is fitted with "world-class fire control" according to General Dynamics, but it appears to lack an independent commander's sight in it's current iteration. Instead it is only fitted with a gunner's sight apparently based on the M1 Abrams' Gunner Primary Sight (GPS). An interesting fact of the prototype is, that it has been presented with two types of multipurpose rounds (HEAT and HE), but not with APFSDS ammunition. This might imply that the muzzle break affects the ability to fire APFSDS rounds, but it might just as well be a coincidence. The APFSDS ammunition was located at the other side of the vehicle and is clearly visible on this and other photographs. The gun can fire anti-tank guided missiles, although the US Army currently has no gun-launched guided missiles in it's inventory. The Griffin is manned by a crew of four. This means it is not fitted with an autoloader and instead a soldier loads the gun. The commander is provided with a large cupola for better situational awareness. Currently there is no remote weapon station (RWS) and no pintle-mounted machine gun for use against infantry and aircrafts. As for protection and mobility, General Dynamics' information is currently very limited. 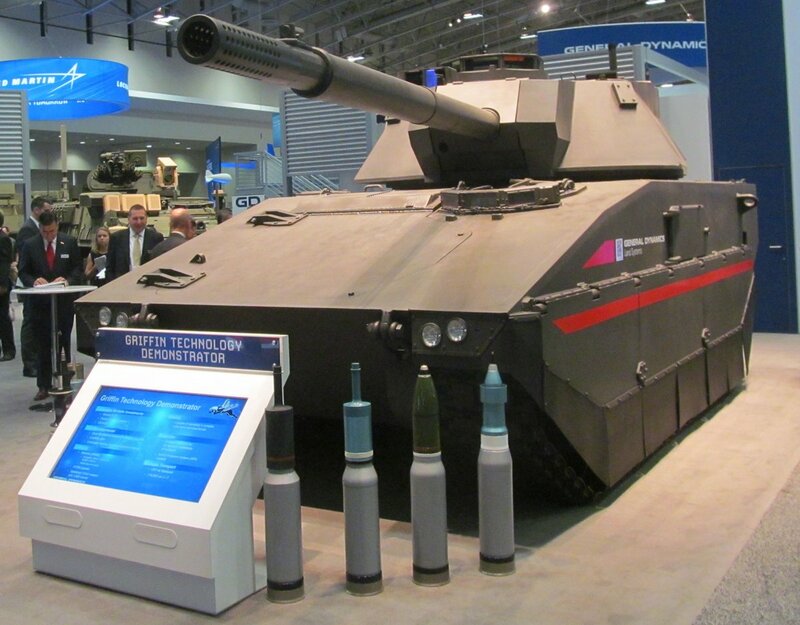 The Griffin is capable of adopting an active protection system (APS). Most likely the Griffin is fitted with a MTU engine, Renk transmission and DST tracks (formerly Diehl tracks, but KMW bought the responsible subsidiary from Diehl), which have been used on all other ASCOD chassis designs. Given the relatively low weight, the passive armor protection might be limited. The ASCOD 2 Direct Fire version proposed by General Dynamics European Land Systems (GDELS) was fitted with Cockerill CT-CV 105HP turret with 105 mm gun and was expected to weigh some 30 metric tons. While there is a possibility that the steel hull of the ASCOD 2 might have been less weight efficient than the Griffin hull (which might made from glass-reinforced plastic fibres), the turret (with an autoloader and only STANAG 4569 level 3 or 4 protection) should most likely be more weight-efficient than the Griffin's three-men turret. The ASCOD 2 DF's hull was fitted with composite applique armor for protection against 30 mm APDS/APFSDS from 1,000 metres along the frontal arc (which is actually slightly below STANAG 4569 level 6, which calls for protection from 500 metres distance) and 14.5 mm AP ammunition at the sides. It seems unlikely that the Griffin will exceed this protection level. 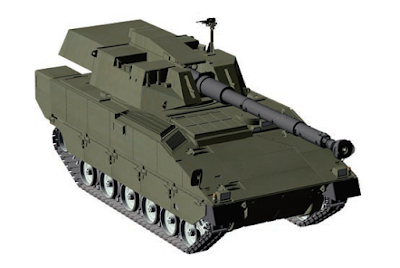 The Composite Armoured Vehicle (CAV) and the Composite Armoured Vehicle Platform (ACAVP) of the UK utilized a hull made of glass-reinforced plastic and shows why the Griffin is believed to feature such a hull design. At 24 metric tons it provided all-round protection against 14.5 mm AP and frontal protection against 30 mm AP ammunition. "The Griffin uses a tracked chassis, which seems to be based on a composite fibre construction, a technology already tested during the 1980s and 1990s." And do you know the strength and weaknesses of this construction compared to say: Steel? Prof. Richard Ogorkiewicz has written a bit on the topic of composite-materials for vehicles in his book "Tanks: 100 years of evolution". The US tested prototype variants of the M113 and M2 Bradley manufactured with fibre-glass composite hulls in the 1970s and 1980s. The material used S-2 glass fibres (used for aerospace applications) bonded with thermosetting polyester resin. The material contained up to 61% glass. The main benefit of this material was that it offered higher protection than aluminum per weight; weight savings up to 33% were planned, but not very realistical; the turrets and numerous components (such as engine, tracks, etc.) were still made of metal. Overall about 10% weight saving was possible according to Ogorkiewicz. The British Army also tested fibre-composite materials for the military vehicles such as the Composite Armoured Vehicle Platform. ThinkDefence wrote that the ACAVP was constructed out of E-glass, because S-2 glass fibres were too expensive. E-glass costed about £3 per kilogram, while S-2 glass costed about £11 per kg (steel costs less than £1 per kilogram). The British Army believed that weight reductions of 20 to 30% were possible on the ACAVP; the also claimed that the composite fibre construction has greater growth potential, given that the material has a higher structural stiffness. If they have used a standard Ajax vehicle as basis (and it looks like), we'll bet for a classical steel hull. GDELS Trubia factory (where all ASCOD 2 / AJAX hull prototypes are assembled) has no capacity to do it AFAIK. There has been several prototypes of composite hulls, but only K21 has seen full production for the moment, we don't know if the weight restrictions to allow autonomous amphibious operations were mandatory over other considerations. I am not sure about the Griffin being based on a steel hull. The latest reports indicate a weight of 27 metric tons for the Griffin; the turret is claimed to weight about a third of the Abrams turret (implying a weight of 7 to 8 metric tons). Given these values, the ASCOD 2 hull would weigh only 19 to 20 metric tons, which seems to be quite low based on the fact that the ASCOD 2 is designed with greater mine and ballistic protection (and more engine horsepower) than the ASCOD 1. The Griffin hull also has clear edges creating a box-shaped appearance, while the known examples of ASCOD hulls without applique armor always have rounded edges at the transition from hull front to hull side. The Future Combat Systems, which is mentioned on the data sheet from AUSA, utilized what has been described as "plastic armor". This armor incorporated foamed aluminum and glass-reinforced plastics. Maybe you pointed the right way, is it an ASCOD 1? Check the NBC register door on the left hull, next to the General Dynamics logo.It's only present on Ascod 1 prototypes and Spanish Pizarros, not in Ulan, Ascod 2 prototypes (PT5, FRES, ASCOD DK..). Is it Ascod 1 PT3, used to test different turrets (Centauro, LT105...), later used as testbed mule for FRES/AJAX turret??? Many companies have launched light tanks the last decades but has anyone actually gotten a contract? Russia has some heavily armed light vehicles for their airborne forces and China has some model to be used in difficult terrain but no western country use a light tank as far as I know. The light tank is a bit like the battlecruiser; a great concept on paper but hard to use right in the real world.